GET BACK TO WORK ASAP! Positive/Refusal Drug & Alcohol Test? Need to get back to work ASAP? Need to get enrolled TODAY? Our trained and knowledgeable staff work to ensure that cases are handled efficiently and according to DOT regulations. If you are a DOT safety sensitive employee in violation of the drug and alcohol testing regulations, you are required to complete the DOT Return-to-Duty process, which involves being evaluated by a Substance Abuse Professional (SAP). 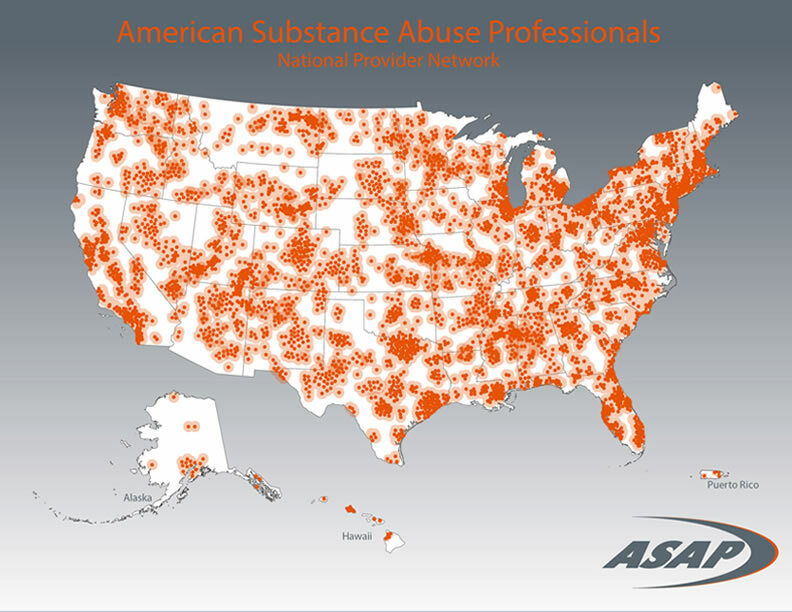 ASAP maintains a nationwide network of qualified DOT substance abuse professionals. ASAP can provide you access to a local qualified SAP. When a substance abuse evaluation is required or recommended ASAP can provide timely appointments and quality care. Call us at 888-792-2727 and take the first step in the process to return to work safely. The Substance Abuse Professionals in the ASAP provider network are properly credentialed and qualified to perform a DOT SAP evaluation prior to being assigned a case. Who is required to go through the SAP Process? All DOT regulated safety-sensitive employees employed in the aviation, railroad, public transit, trucking, maritime, and pipeline industries who have violated the DOT drug and alcohol testing rules, such as a positive test result. How do I know that the SAP is qualified to handle DOT compliance cases? NOT ALL SUBSTANCE ABUSE CONSELSORS ARE DOT QUALIFIED SUBSTANCE ABUSE PROFESSIONALS (SAPs)! SAPs are required to have specialize training, credentialing and continuing education on drugs and alcohol her DOT CFR 49 Part 40 guidelines. They must also adhere to specific rules and regulation regarding facilities in which they recommend for treatment and education. Have more questions? Call or contact us today, we have the answer. American Substance Abuse Professionals, Inc. (ASAP) provides customized drug-free workplace solutions and risk prevention safety programs to companies seeking to reduce healthcare costs, save on workers' compensation premiums, increase employee retention, reduce workplace accidents and maximize employee productivity. ASAP serves to benefit employers, human resource managers and employees. Additionally, ASAP offers professional development courses, and qualification courses to DOT Substance Abuse Professionals (SAPs) and NRC Substance Abuse Experts (SAEs). © 2015. American Substance Abuse Professionals, Inc. All Rights Reserved.